Alexandra Cabane was ready for a change. Her life was going well, but she felt like something was missing. She had been following the work of Tony Robbins for a while, and finally decided it was time to work with a Results Coach. Alexandra was hesitant at first to partner with a professional coach. What could someone else offer her that she couldn’t do herself? She was looking for help growing her business, but her coaching journey took her much further than that. After one coaching session, Alexandra was hooked. She already felt like her life was changing for the better. She was more aware, more confident and felt more capable to achieve everything she dreamed of, including strengthening her personal relationships. Alexandra was already running a successful business before working with a Results Coach, but she knew she was capable of more. Her coach helped her lay out a clear path to reach her goals – to take action and finally realize her dreams. After only six months with her Results Coach, she was on the path to triple her business. Working with a professional coach was the extra push Alexandra needed to pursue the things she’d been putting off – including looking for a fulfilling romantic relationship. Her coach took on many roles to truly meet her needs in all areas of life. For her business, her coach was a mentor and strategic partner to guide her in tough times and hold her accountable. For her relationships, Alexandra’s coach served as an objective eye helping her change perspective and open up to new possibilities. Once she realized it was her own limiting beliefs keeping her from true connection her whole world changed. Conversations with her Results Coach gave Alexandra the clarity of purpose to find her ideal partner. Her coach helped her see what she was holding back before and gave her the tools to identify and eliminate the untrue beliefs that previously kept her from building deep connections with others. Through coaching, Alexandra also got crystal clear on what she was looking for in a relationship, so she could find and quickly identify the best partner to meet her needs. Now that she was operating in a happy, productive state in other areas of her life she began attracting people who were just as excited and passionate about life as she was. Working with a Results Coach can help you to strengthen all areas of your life – from business to health, personal development or relationships. Whether you’re trying to find ways to make deeper networking connections, bond more closely with your romantic partner or want to tighten up your relationship with your family and friends, a Results Coach can show you how to achieve these goals. Perhaps most importantly, a Results Coach will enable you to form a better relationship with yourself. A coach will challenge you to think about what you really want from life and develop a customized plan to help you get there. 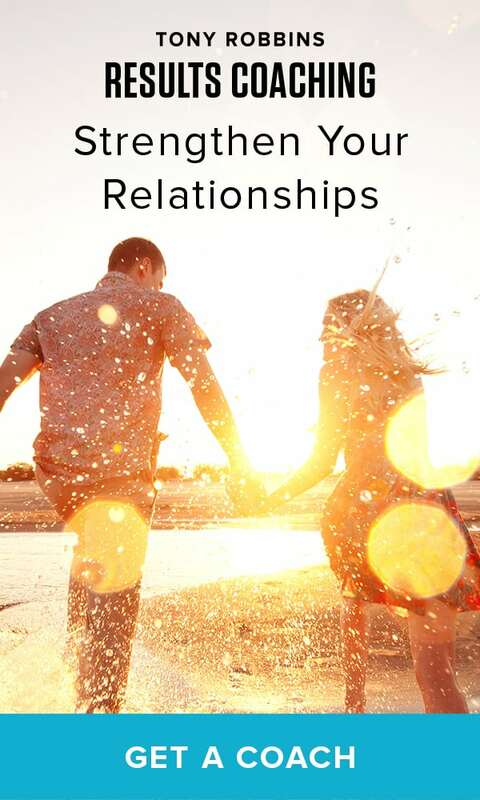 Ready to strengthen your relationships and take your life to the next level? Sign up for your complimentary introductory session with a Tony Robbins Results Coach today.